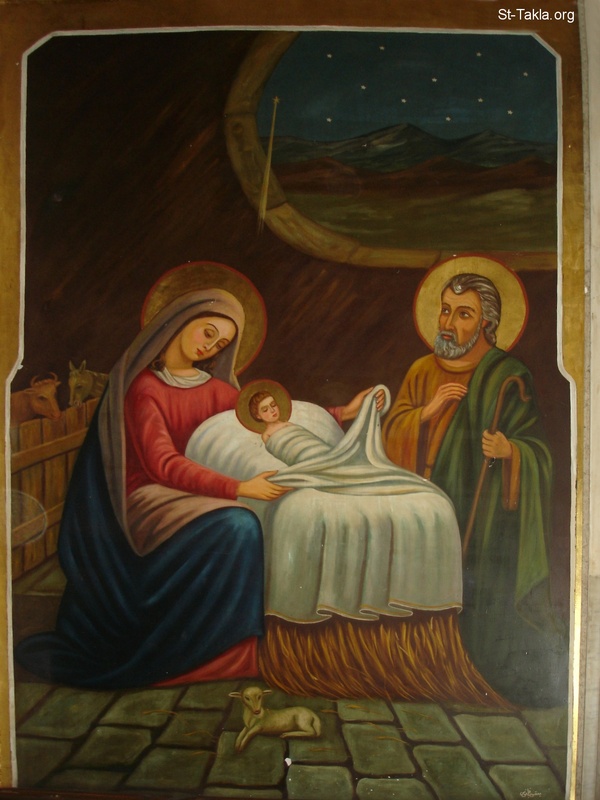 Christmas Sermon 2015 – Merry Christmas to all! The greeting and response for today until January 1 is Christ is born! Glorify Him! Christos razdajetsja! Slavite Jeho! In every Liturgy, we are present at the mystery of Jesus’ life, most especially the Last Supper, the Crucifixion, the Resurrection – and the opening words of the Divine Liturgy , Blessed is the kingdom – puts us squarely into a place beyond time – the kingdom of God, breaking into time, piercing the darkness of the fallen world with the light not only of the risen Lord, but of the Son of Man at His Second Coming. Thus, everyone faces east together, led by the priest, assisted by the deacon and altar servers, the cantor and choir, the assembly of the People of God gathered together for the Eucharist, the great mystery of Thanksgiving and of Christ among us. There will be no end to this kingdom, a kingdom beyond time, a kingdom whose king began, in one sense, as any other king does, a baby in the mother’s womb. But also a kingdom led by the Eternal Word, the Logos, the Second Person of the Trinity, Who time cannot contain, Who made all things as the agent of the Father and with the power of the life-giving Spirit. This Same Word is born for us tonight, God and Man, Eternal Word and Son of Mary, the Son of Man awaited for centuries upon centuries, the promise made by God to Adam and Eve as they were driven from the Garden of Eden is fulfilled, and the heel of this pure woman crushes the serpent of sin and this baby conquers everything. The gift of liturgy is to be present at the original events -this is what it means, in theology both Christian and Jewish, to remember, the anamnesis which Jesus commanded at the Last Supper: do this in memory of Me. And so we are present at the greatest paradox of all time: God born in the flesh. On this day when the Rich One was made poor for our sake, let the rich man also make the poor man a sharer at his table. On this day a Gift came out to us without our asking for it; let us then give alms to those who cry out and beg from us. This is the day of reconciliation; let us be neither wrathful nor gloomy on it. On this perfect day, let us be neither menacing nor boisterous. This is the day of the Sweet One; let us be neither proud nor haughty. On this day of forgiveness let us not avenge offenses. On this day of rejoicing let us not share sorrows. On this sweet day let us not be vehement. On this calm day let us not be quick-tempered. The Lord of nature today was transformed contrary to His nature; it is not too difficult for us also to overthrow our evil will. Today the Deity imprinted itself on humanity, so that humanity might also be cut into the seal of Deity. People who’ve drifted from faith today either talk about the spirit of Christmas, meaning happiness, peace, gift-giving and gift-receiving, charity, love and kindness without mentioning Jesus Christ Who is the source of it all. Other people are forced to celebrate the winter holiday because some politically correct fool who has been given a big salary to head the office of inclusivity and diversity at a company or school or government makes sure that even the word Christmas dare not appear in speech or print. Jesus comes to us this night of nights, launching twelve days of celebration from now until his baptism on January 6th, in order to lead us to Himself, there to be truly changed by God’s grace, to become who we are meant to be: children of God the Father, brethren of Jesus, hands of the Holy Spirit in a fallen world. God loves us intensely, each one of us ever conceived, including those never born, because we are made in our mother’s womb in a wondrous way, to be in His image, male and female, each of us, and therefore worthy of His love, every one of us, no matter who we are or if we’ve done wrong. Jesus chooses to be born in the barn, with straw and hay as His bed, lying in the feed trough of the animals, which is what the manger is, and warmed by the breath of the ox and donkey, who recognize Him as their true Master, as the prophet Isaiah wrote. He is worshipped by the shepherds, men and boys who lived in the fields with their flocks of sheep, who could never stay clean according to the rules of the Jewish law, even though their sheep would be good enough to be sacrificed in the temple that they were never allowed to enter. Jesus is honored by the astrologers, wise men from the East, who give him those so-symbolic gifts of gold, for a king, frankincense used to worship God, myrrh for anointing the sick and embalming the dead. They find Him through the star that God uses to announce the coming of His Son, a star that not only leads them, but stops over the house where the Holy Family is allowed to stay after the birth. So the birth of the Messiah of all mankind is announced by shepherds who were despised by the clergy and pagans who were despised by all Jews, born to a virgin who should not have had a child, under the protection of a man who would never have his own children but would raise the Son of God as his own. It is a feast of paradoxes and surprises, surprises greater than any of the ones we will be unwrapping under the tree. We give presents to each other because the three astrologers did the same to Jesus, but now the entire retail system of the world’s greatest economy is profitable only if it is an expensive Christmas season and millions of presents are bought. The Church calls us to remember Who Jesus is, and what He is, and who we are: His brothers and sisters, Whom He redeems by His coming, and only by the sacrifice He makes on the Cross. This little baby is the savior of the world, the savior of the human race, the One for whom humans had been waiting, the One Whom many humans have yet to know. Let us rejoice today, and throughout the twelve days, and let us honor Him by following what He teaches us through His Good News and through the Church that He founded while on earth and of which He is still the true Head, and whose vicar is the Pope in Rome. And let us love those around us and those far from us. Above all, let us be the good tidings of comfort and joy not only tonight and throughout the twelve days, but for the rest of the days which we enjoy on this earth before we finally see Him face to face. And in this Eucharist, let us welcome the Baby Jesus into our own hearts and minds, and let Him speak to us on this special night. « Christmas is coming: but what’s coming for the Iraqi Christians? ?